Open letter to President Obama (Part 557) Gun control can cost lives!!!!! This story belongs in my “Great Moments in Local Government” series, which features examples of bureaucratic and political stupidity (see here, here, here,here, here, here, here, here, here, here, here, and here) that will make you laugh, cry, yell, or all of the above. 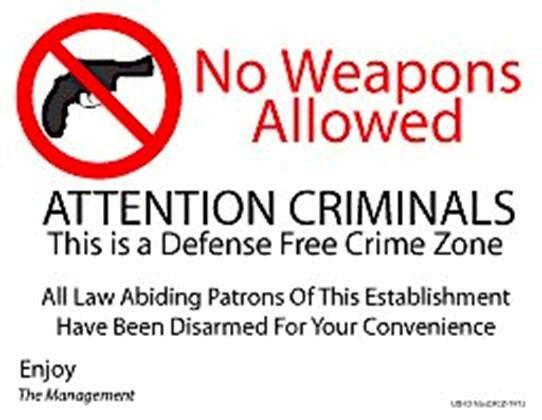 Ft Hood murders demonstrate that even nutjobs engage in planning and figure out that they will have more ability to kill if they choose venues where potential victims are disarmed! Ft Hood murders demonstrate that even nutjobs engage in planning and figure out that they will have more ability to kill if they choose venues where potential victims are disarmed! The sad truth is we have seen this played out now twice at Ft Hood but the policies have not changed. Why do you believe taking guns away from honest people will lower violence? The United Nations is full of gun control nuts. Citing the analysis of America’s former Ambassador to the United Nations, I wrote last year about a treaty being concocted at the United Nations that would threaten our right to keep and bear arms. Well, with the aid of the Obama Administration, this new treaty has been approved. Fortunately, there probably are not 67 votes in the Senate to ratify the measure. And that’s a good thing. The Wall Street Journal has a column by John Bolton and John Yoo explaining why the new U.N . treaty is so misguided and dangerous. …the new treaty also demands domestic regulation of “small arms and light weapons.” The treaty’s Article 5 requires nations to “establish and maintain a national control system,” including a “national control list.” …Gun-control advocates will use these provisions to argue that the U.S. must enact measures such as a national gun registry, licenses for guns and ammunition sales, universal background checks, and even a ban of certain weapons. 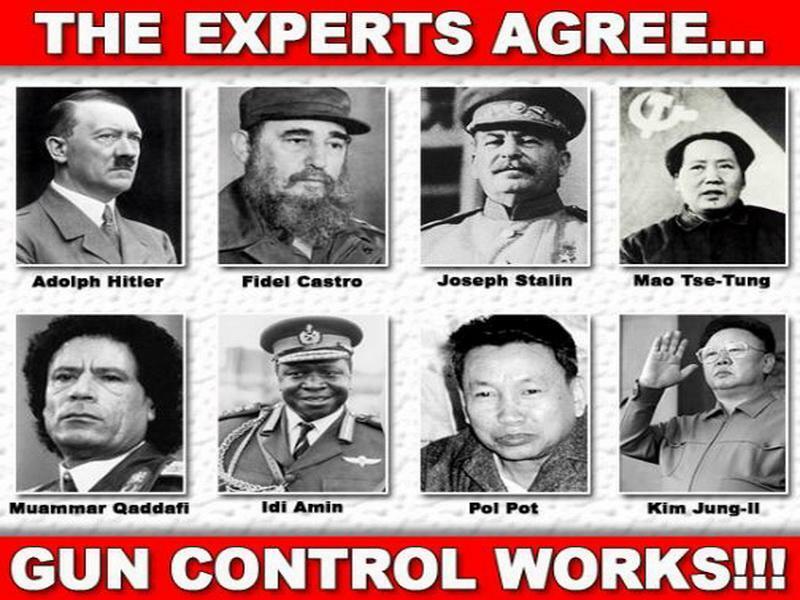 The treaty thus provides the Obama administration with an end-run around Congress to reach these gun-control holy grails. But doesn’t the Second Amendment protect our rights, regardless? Unfortunately, that’s not clearly the case, as Bolton and Yoo note. The Constitution establishes treaties in Article II (which sets out the president’s executive powers), rather than in Article I (which defines the legislature’s authority)—so treaties therefore aren’t textually subject to the limits on Congress’s power. Treaties still receive the force of law under the Supremacy Clause, which declares that “This Constitution, and the Laws of the United States which shall be made in Pursuance thereof; and all Treaties made, or which shall be made, under the Authority of the United States, shall be the supreme Law of the Land.” …this difference in language between laws and treaties allows the latter to sweep more broadly than the former. One thing we can state with certainty is that opponents of individual rights will use the treaty to push an anti-gun agenda inside the United States. And since the Supreme Court has upheld the Second Amendment by only one vote, I’m not overly confident that we can rely on the judiciary anyhow. Ultimately, our fundamental rights to protect ourselves and our families only exist because politicians are scared of getting voted out of office and losing the best job most of them will ever have. And remember that the “slippery slope” is a very relevant concern. 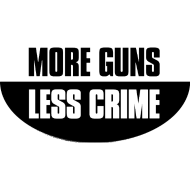 Many anti-gun activists think only government should have the right to possess guns, and they view incremental gun control measures as building blocks to that ultimate goal. 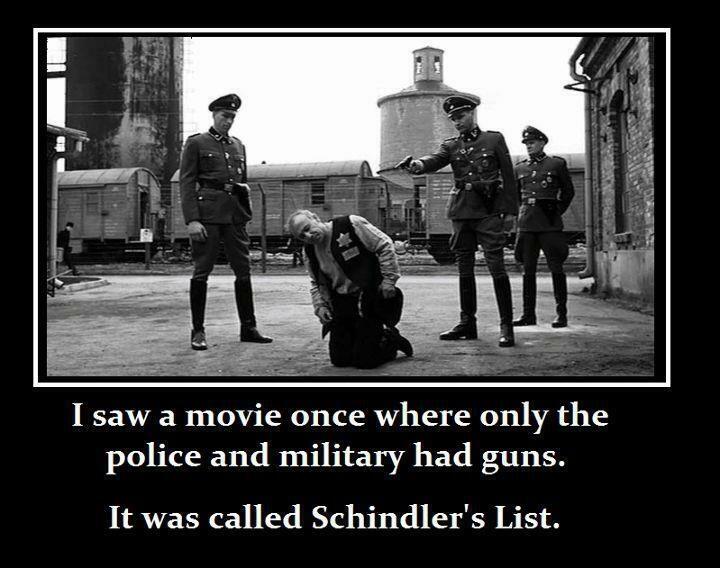 Even though government monopolies on gun possession have been associated with some of the world’s most brutal dictatorships! I’m not worried that the United States is going to turn into some Venezuelan-style anti-gun totalitarian regime, so I actually disagree with the results of my poll on the biggest reason to oppose gun control. If I was asked to give my worst-case scenario for why we need private gun ownership, it would involve fiscal and societal breakdown because of an ever-growing welfare state. But regardless of why you believe in the Second Amendment, this U.N. treaty would be a very bad development. I recently put this up on my website and I thought it would interest you. Gun control just doesn’t work. I have taken the time to write President Obama on this issue of gun control several times and have even got a letter back from the White House on it. Plus a friend of mine by the name of Charlie Collins has even put forth bills in the Arkansas State House of Representatives concerning gun rights. I’ve shared some powerful (and amusing) pro-Second Amendment posters here, here, here, here, here, here, and here. 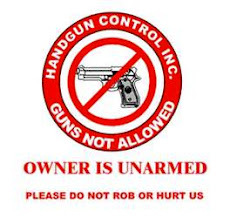 And some clever images of t-shirts and bumper stickers on gun control here, here, here, here, and here. Here’s another good one for the collection, and I gather you can actually buy one for yourself if this website is legit. Here are some additional examples of Second Amendment humor, and you can enjoy some Chuck Asay cartoons here and here. By the way, if you want some practical information on gun control, I strongly recommend the famous Larry Correia article. And for wisdom on the issue of so-called assault weapons, John Lott is the oracle. And you can read the confessions of two honest liberals here and here. Dan Mitchell takes on gun control nuts!!! 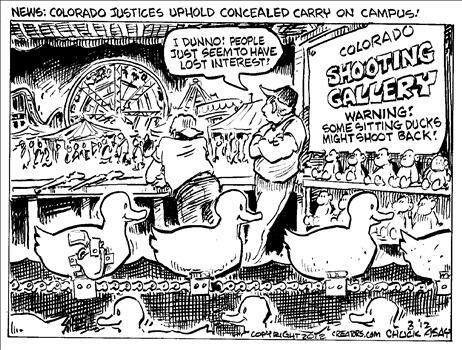 Could Dark Knight mass murder in Colorado been avoided by more gun control? I do love Michael Moore’s movie “Canadian Bacon” and I have blogged about it before. However, I am not a big Michael Moore fan. Take a look at this excellent article by Trevor Burrus of the Cato Institute on Moore’s latest stupid claim. I believe someone in Newtown, Connecticut—a grieving parent, an upset law enforcement officer, a citizen who has seen enough of this carnage in our country—somebody, someday soon, is going to leak the crime scene photos of the Sandy Hook Elementary School massacre. And when the American people see what bullets from an assault rifle fired at close range do to a little child’s body, that’s the day the jig will be up for the NRA. It will be the day the debate on gun control will come to an end. There will be nothing left to argue over. It will just be over. And every sane American will demand action. The first picture is of Sgt. Lisa Castellano. Two days after the Newtown tragedy, Sgt. Castellano was off-duty and working security at a movie theater. A gunman walked in and began firing. She stopped the gunman after he had shot one man. The second picture is of Jeanne Assam. In 2007, Assam stopped what could easily have been the largest mass shooting in U.S. history at the New Life Church in Colorado Springs. A severely deranged man, who had already killed two people at a youth mission in northern Denver the night before, entered the church with the same armament as Newtown killer Adam Lanza and began shooting. At the time, approximately 7,000 people were in the church. Assam stopped him after he had killed two and wounded three. In his post, Michael Moore reminds us that “2,600 Americans have been killed by guns since Newtown.” I’d like to remind him that, using the lowest estimates of the number of defensive gun uses per year, guns have averted between 27,000 and 207,500 crimes in the three months since Newtown. I have put up lots of cartoons and posters from Dan Mitchell’s blog before and they have got lots of hits before. Many of them have dealt with the economy, eternal unemployment benefits, socialism, Greece, welfare state or on gun control. Remember the Fort Hood shootings, when the crazed Islamist killed a bunch of people? How many of us know that Major Hasan had the ability to kill so many people because of a Clinton-era policy limiting gun possession on military bases? 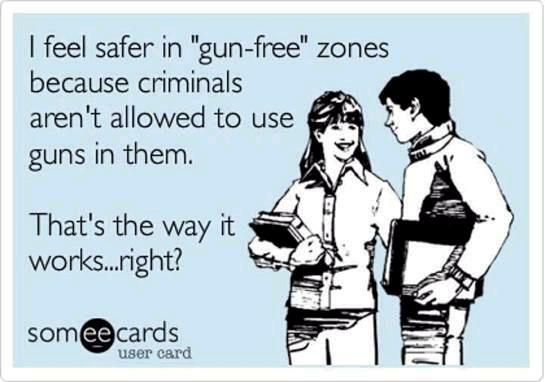 In other words, the government created a safe zone for the killer. 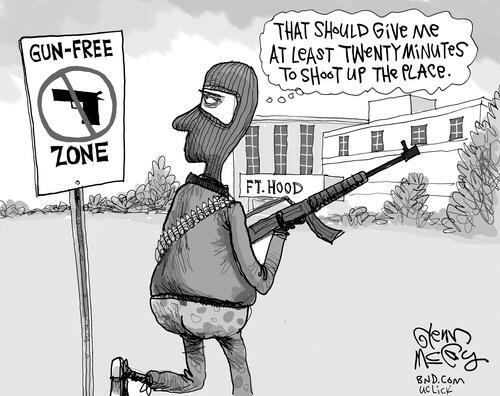 This is why “gun-free” zones are stupid at best and more likely to create dangerous environments. If you’re a vile, evil, or crazy person, that’s where you’ll go because nobody can shoot back. This great Chuck Asay cartoon makes this point, celebrating a recent Colorado Court decision (you can see more of his cartoons here, here, here, here, and here). 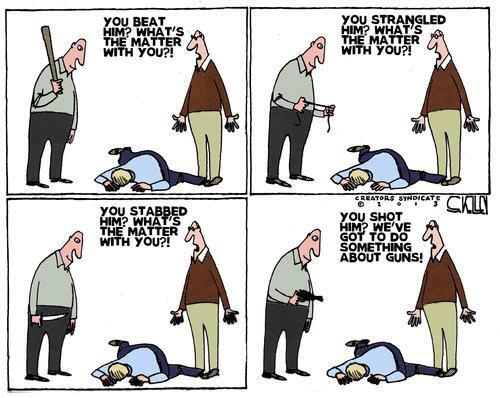 The cartoon is superb, but I also recommend this post reviewing a Cato study on the use of guns in self defense. And these posts about Chicago and New York City will probably get you upset. And here’s some great analysis of gun control by Stephen Hunter, and my NRA-TV interview on the importance of gun ownership if America suffers a European-style societal breakdown. Sometimes you just have to look at the facts!!! In a presumably futile effort to change their minds by learning how they think, I periodically try to figure out the left-wing mind. Why, for instance, do some people believe in Keynesian economics, when it is premised on the fanciful notion that you can increase “spending power” by taking money out of the economy’s left pocket and putting it in the economy’s right pocket? I actually think part of the problem is that folks on the left focus on how income is spent rather than how it’s earned, so I sometimes try to get them to understand that economic growth occurs when we produce more rather than consume more. My hope is that they’ll better understand how the economy works if they look at the issue from this perspective. But I’m getting off track. I don’t want to get too serious because the purpose of this post is to share this satirical look at the how leftists rationalize their anti-gun biases. Let’s take a look at two cities that are quite similar in terms of demographics and income. But they have very different murder rates. Your job is to pretend you’re a leftist and come up with an explanation. To be fair, we can’t rule out cold weather as a possible explanation given this limited set of data. For what it’s worth, however, scholars who actually do real research, like David Kopel and John Lott, reach different conclusions. 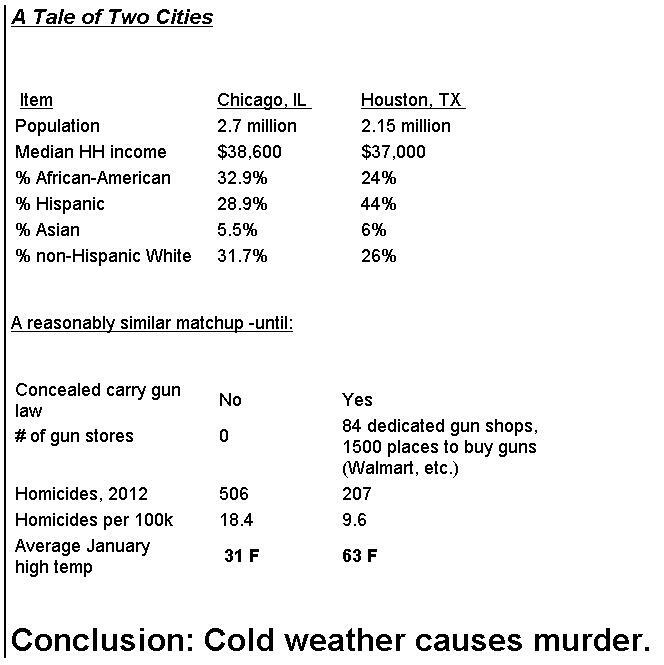 Returning to satire, the Houston-Chicago comparison reminds me of this IQ test for criminals and liberals. And since we’re having some fun with our liberal friends, let’s close with this comparison of liberals, conservatives, and Texans. I have posted some cartoons featured on Dan Mitchell’s blog before and they are very funny. 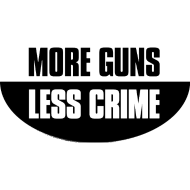 Open letter to President Obama (Part 428) More guns lead to less crime? After reading this article below I learned anti-gun laws facilitated the terrorist attack at Fort Hood and gun control made Jamaica a more dangerous country.It is a very fine article and I really enjoyed it. It’s not the gun that kills, but the person behind the gun. No violence from tank owners in USA. 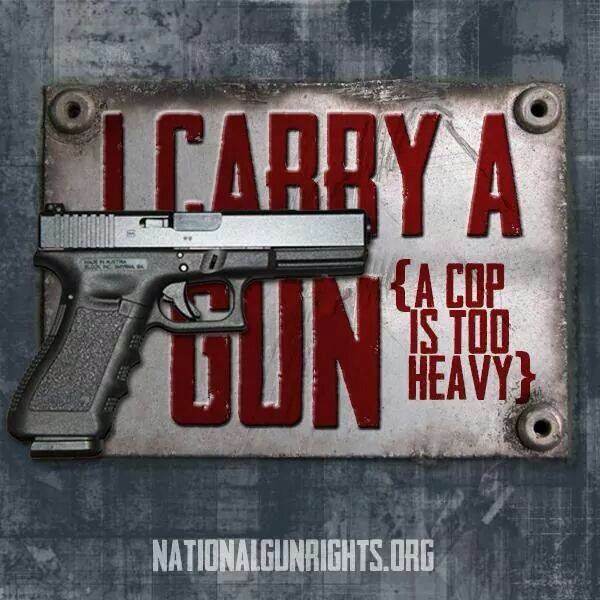 Yup, and it can even have a working gun if you’re willing to fork over $200 for a permit. A tank in the U.S. can have operational guns, if the owner has a federal Destructive Device permit, and state laws don’t prohibit it. The permit costs $200, and the applicant must swear he hasn’t been a “fugitive from justice,” “adjudicated mentally defective” or convicted of “a misdemeanor crime of domestic violence.” A local law-enforcement official, usually a sheriff or police chief, has to sign off on the application. Tanks generally aren’t street-legal, so owners usually drive them off-road or on other private property. Some say local authorities sometimes make exceptions for parades, a quick test drive or a trip to the gas station. But won’t tanks in private hands lead to horrible crimes? Doesn’t seem that way, particularly since the story mentions that the only tank used in a crime was one taken from a government armory. And in sensible places such as Texas, local police think a tank is “awesome,” not a cause for hysteria. 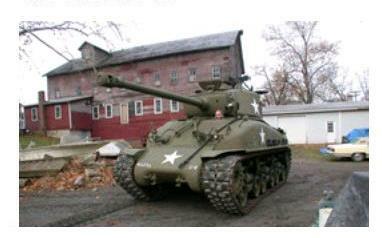 Earlier this month, Mr. Bauer, the Texas banker, took his Chaffee out for a spin in his warehouse parking lot. He had rigged the .50-caliber machine gun on the turret with a propane system that generates the noise and muzzle flash of gunfire, without the bullets. He fired off several bursts. Minutes later, two Port Lavaca police cruisers pulled up. The first officer rolled down the window and asked dryly: “You know why we’re here, right?” Mr. Bauer assured him that no actual rounds had been fired. …The second policeman, Jeremy Marshall, got out of his car and eyeballed Mr. Bauer’s tank. “Awesome,” he said. Meanwhile, a 6-year old boy in Maryland is suspended for making a gun shape with his fingers and a 5-year old girl in Pennsylvania is busted for having a pink plastic gun that shoots bubbles. The best of America…and the worst of America. Speaking of our friends on the left, Vice President Joe Biden is overseeing an Administration effort to concoct new gun laws. In the interests of being helpful, I suggest the Veep’s team look at these four videos. Gun control is just stupid. I’ve shared some very powerful videos that help explain why we should respect and celebrate the individual right to keep and bear arms. Here’s one that’s worth sharing just for entertainment value. It shows a British import desperately trying to gain visibility and ratings by engaging in a series of gun control debates. I can’t vouch for the veracity of what’s being said by Ventura, Pratt, et al, but they obviously win the overall arguments about the right to self defense, the fight against crime, and having the means to resist tyranny and oppression. But as much as I like all of these videos, the best arguments for the Second Amendment come from this conservative and this liberal. Actually, I don’t even know if the author of the first article is a conservative. Or even libertarian. He just makes so much sense that I assume he’s on the side of freedom instead of the state.